Cardinals left-hander Tyler Lyons is headed to the disabled list for the second time this season. 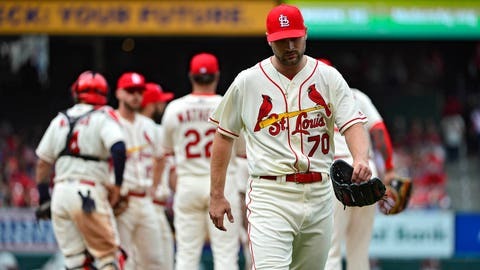 ST. LOUIS — St. Louis Cardinals reliever Tyler Lyons is headed to the disabled list for the second time this season, and to fill his roster spot the team has recalled reliever Mike Mayers for his seventh big-league stint of the year. Lyons was placed on the 10-day disabled list with a left elbow strain, retroactive to June 6, prior to Friday night’s game against the Cincinnati Reds. Mayers, who made the major league club out of spring training, has now been sent down to Triple-A Memphis and then recalled six different times. Lyons, who was on the disabled list May 11 to May 25 with a back strain, has a 5.93 ERA in 22 appearances (13.2 innings) this season. As he heads back to the DL, the Cardinals are down to two left-handed relievers in their bullpen: veteran Brett Cecil and rookie Austin Gomber. The 26-year-old Mayers has a 2.30 ERA in 12 appearances (15.2 innings) for the Cardinals this season.